Via The Lefty, we bring you an auction that will stain your heart and make you long for the tasteful elegance of Takeru Kobayashi vomiting on live national television. 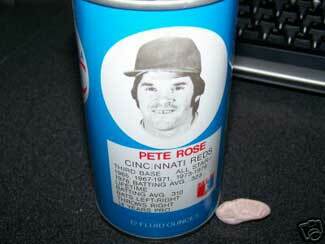 You can guy a piece of 30-year-old chewed gum straight from the mouth of Pete Rose. Amazingly, it's not actually Pete who's selling it, though this probably gonna give him some ideas. you are bidding on a ONE OF A KIND lot!!! All the items for one price! First you will receive a piece of chewing gum thrown by Pete in disgust after a strikeout in a loss to the St. Louis Cardinals on 8/31/1975. The gum was thrown toward the dugout and stuck to the top wall where it was retrieved by my grandfather and stored for over 30 years. The gum is as hard as a rock but in original chewed condition. It occurs to us that this piece of gum is exactly 40 days older than we are.